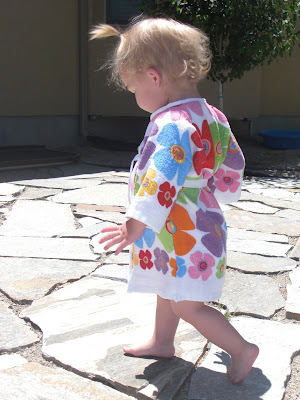 Obsessively Stitching: Toddler Dish Towel Bathrobe! 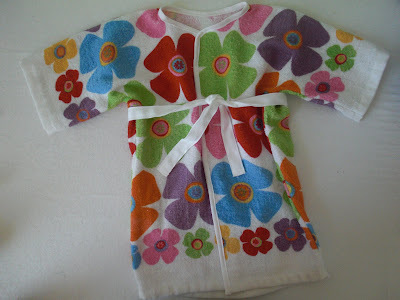 Today's Dollar Store Craft is an incredibly adorable toddler-sized bathrobe! It's perfect for throwing on after a bath or a swim, and best of all, it's made from TWO dollar store dish towels! It's so simple to make, yet certainly has a lot of bang for your two bucks! 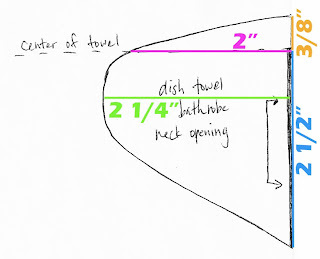 ~ Two terry dish towels -- mine measured about 14.5"x24"
STEP ONE: Prewash and dry your towels and twill tape! STEP TWO: Fold one towel in half from hem to hem and cut along the fold, as shown. STEP THREE: Fold your second towel in quarters to find the center and mark. Fold from hem to hem and cut from one edge to the center, as shown. STEP FOUR: With your towel still folded cut a small neck opening, as shown. STEP FIVE: Lay your towel with the neck opening on a flat surface. STEP SIX: Lay one of your dish towel halves on top, right sides together, with the raw edge centered on the edge. Pin, being careful not to stretch the towels. Sew with a 3/8" seam allowance. Repeat Steps Five and Six for the opposite side of your towel, as shown. STEP SEVEN: Continue the center front cut line through the hem of your towel, as shown. STEP EIGHT: Remove a small amount from the "underarm" area of the robe. Fold your robe right sides together and cut away a 1 1/4" width rectangle. This makes the sleeves narrower and more fitted, and also eliminates the bulky finished edge of the towel. At this point I serged the seams where I attached the towels to each other, then topstitched the seams down. I do recommend finishing the edges to avoid fraying, but you could certainly use a zigzag stitch if you don't have a serger. STEP NINE: (not pictured) Sew the side seams on each side from the hem of the sleeve all the way around to the hem of the robe. Use a 1/2" seam allowance. Serge or zigzag for a finished edge on the seams. Note: If you like, you can add twill tape loops for your robe when you sew the side seams. STEP TEN: Cut a 1 1/2 yard length of twill tape and press it in half lengthwise, as shown. This will be the binding for the raw edge opening of your robe. STEP ELEVEN: Carefully bind the robe opening, starting at the hem on one side (finish the ends of the twill tape by folding them inside before you sew), and continuing all the way around to the other hem. This finishes the edge of your robe beautifully, without the need for bias tape or a facing! STEP TWELVE: Cut your remaining twill tape into two 1 yard pieces. Layer them together and sew all the way around. This is the tie for your robe. 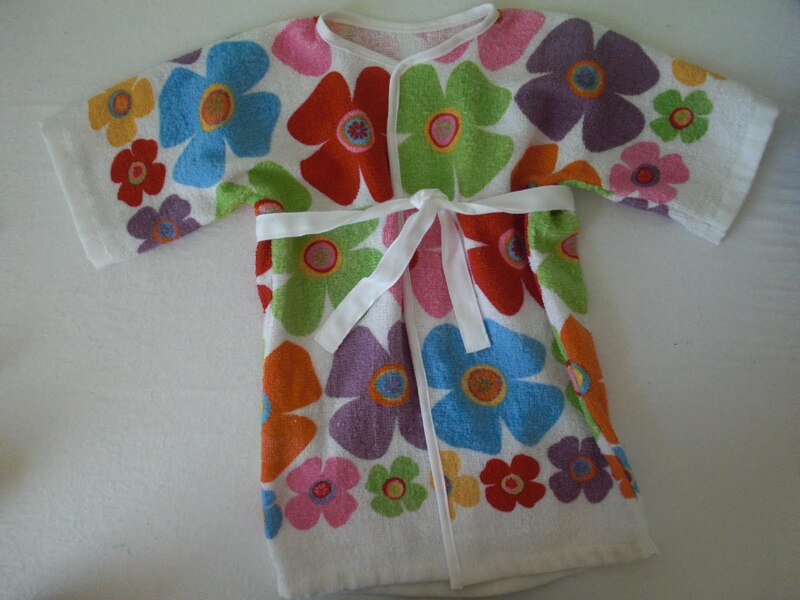 Your adorable little robe is finished! It absolutely KILLS me -- it's so stinking cute on JellyBean! And she loves it, too! wayy cut care! she is too cute. Wow, that's pretty darn genius! I'm going to have to try this with bigger towels and see if it works for a bigger kid! Will let you know how it goes... thanks so much for sharing. Couldn't be any cuter! what a fun project! P.S. Do you think you'll be doing another I-Spy swap anytime soon? I just bought some fabric online that I'd love to use for a swap! how sweet, what a great tute, thanks for sharing. You are so smart to put together such cute things! My grandson is almost 3, so I'd have to buy bigger towels probably. I made the hooded towel for him from your tutorial. That is so adorable and simple! Thank you so much for the tutorial. My girls are bigger, so I just might have to try it with some small bath towels. That is such an adorable robe. Great job. I have one question about the diagram you drew. Is the right side of that placed onto the fold to cut so it then becomes an oval? Thanks for sharing that with us. Super cute. Found you from dollar store crafts. I love this project it looks fantastic. I just moved, and I think this is the motivation I need to put together my sewing area in my new house! I just have to find some cute boyish hand towels now! Oh goodness! Too cute!!! I want to make this! Fabulous idea and she looks adorable! That's totally cute. I need you to teach me how to use my serger! Another great tutorial!!! seriously super cute!!! So stinking cute! Will be making one for my 3 year old son & my 3 month old daughter! That is adorable and so economical! woah this is amazing! i love it. Beyond adorable, and your Jelly Bean looks edibly cute in it! Great tutorial! Just saw this on be different; act normal and had to make one right away! I used 2 cute heart hand towels from target and it turned out adorable. Thanks for the easy directions! I love it!!! THe perfect after pool robe! Are you kidding me?? I want to see! Will you post to the flickr group or send me an email? :oD I am so excited my tutorial has been put to use already!! Just came over from Be Different Act Normal...I LOVE this. I am bookmarking it totally as something to do...I just wish I had a little girly to put that cute flower one on. Thanks for passing this tutorial on. Care thank you for sharing this with me!!! LOVE IT!! WOW! Genius! I love it! Cute cute...Thanks to U create for sharing your creation with me today!! It's adorable!! This is so cute!!! What a wonderful idea!! Oh my this is just adorable! I am going to make one for my little girl coming in just 4 weeks. Thanks for sharing! I've been want to make something like this for my mister man. I love the dish towels you used! oh, WOW! You continue to amaze me with your creative repurposing and rethinking of materials! And that little bathrobe is so stinkin' cute!! This is so darling- I love the towels you chose as well! Just great! Do you mind that I translate it in Mandarin? I will mark it's from your blog. This is great! My son hates getting out of the tub and wrapped into a towel so this will be nice for him so he can still move while he gets a diaper on! I can't wait to sew one! Will you be getting a blog button any time soon? I'd like to link you. Hi there! from Portugal!! :)) Do you know why i visit you every day, even if you dont post? because i LOVE your work!!!! and you explain it so well! even me, can understand how we can do it! :) Congratulations for this great blog! I've done something very similar for an adult-sized robe. It was based loosely on an instruction card that came with a pack of Caron towels my grandmother bought sometime in the 70s. Toddlers are less picky about the fit, for sure! AWW! That is so, so cute! Thanks so much for this, I'll be linking. Love it! Made one for my littlest guy and now the older one wants one, too! How cute! And I thought I was so clever making purses out of dollar tree dish towels. You win! Thanks for sharing this. It is awesome. I just started taking my 2 year old grand daughter to the indoor pool and she is always cold when she gets out. This will be an expensive and practical item to have. It was so fast and easy to make. Thanks to your wonderful directions. lovely robe, very clrear tutorial. thank you for taking the time! i will try to make this from bigger towels for my 3 year old. thanks for the tute, and the cutie pics! Thanks, it's a great idea ... and sure I'll put it into practice. This is amazingly cute! The dollar store always has dishtowels and target has some super cute prints right now! Thanks for sharing! A Bath towels can be defined as a textile product which is made with loop pile on one of both sides typically covering the entire surface or forming strips, checks, or other patterns. Shop for Royal Air Rich Towels and other quality products. Shop with confidence with Trident Group. The technologically advanced towel is woven of a specially engineered yarn for air creation. Anyway to put a hood on this? 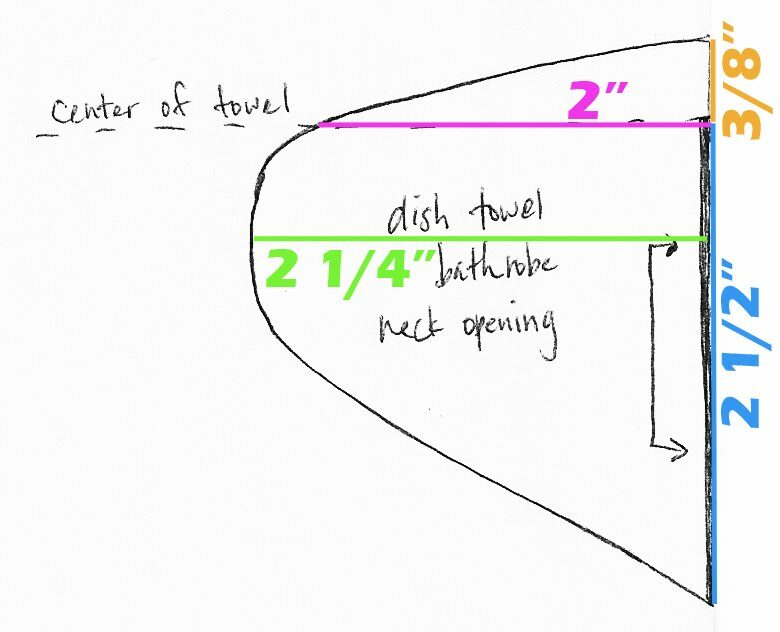 I was thinking of using thicker towels (hand towels) and want to put a hood on it. Does anyone know how I would go about it? Nice Posting! because there are a lot of informative postings so, thanks a lot for sharing the information.